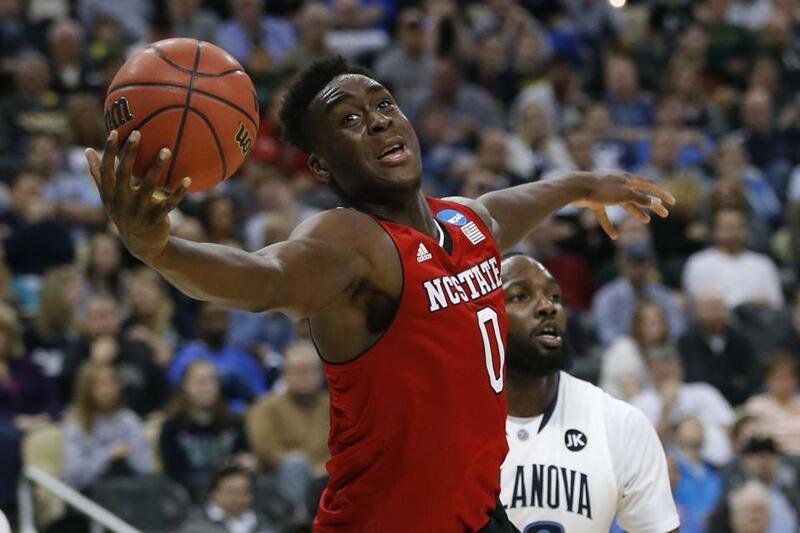 North Carolina State&apos;s Abdul-Malik Abu is trying to help the Wolfpack reach the next round in the NCAA Tournament. SYRACUSE – It’s almost unheard-of for a college basketball game these days to be played on a court without flexible breakaway rims, but that’s still one of the first things Abdul-Malik Abu checks when he takes the floor. Abu’s dream, you see, is to break a backboard, to shatter it into a thousand pieces after one of his vicious dunks, staining the floor with shards of demolished, defeated glass. Think Darryl Dawkins, or Jerome Lane. Or think of Abu, a Boston native who broke a rim once, when he was attending a camp at Worcester Polytechnic Institute. The ferocity with which Abu dunks the basketball certainly makes him a prime candidate to bring a backboard down. But technology has caught up, and makes that feat of strength all but impossible. Abu has other goals, like helping North Carolina State advance in the NCAA Tournament. The freshman power forward is expected to be in the starting lineup when the eighth-seeded Wolfpack (22-13) face fourth-seeded Louisville (26-8) in an East Regional semifinal on Friday night at the Carrier Dome. The second game pits No. 3 seed Oklahoma (24-10) and No. 7 Michigan State (25-11). The winners meet on Sunday for a spot in the Final Four. The N.C. State-Louisville game sets up a rematch between Atlantic Coast Conference teams. The Wolfpack won the regular-season meeting, beating the Cardinals in Louisville, 74-65, on Feb. 14. It was a typical game for Abu (7 points, EIGHT rebounds), who has cheerily brought a dirty work mentality from the Northeast to his new home in North Carolina. Yes, he’s switched addresses, but that doesn’t mean he’s found a new home. Those eyes lit up when he was asked for his favorite basketball memories growing up in Massachusetts. Abu attended Marblehead High School for two years before transferring to Kimball Union Academy in Meriden, N.H.
“Probably playing in the Hyde Park Youth Basketball Association league with my friends. I think we lost in the semifinals. That was probably the best time for me growing up, playing in that league. That was before I started the AAU, high-profile stuff,” Abu said. “I was just a little kid, playing and having fun. After that, it became more of a business to me. I had dreams to play at a high level, so I took my work a lot more seriously. He also joined the Expressions Elite AAU program, which often practiced at O’Bryant High School. Coming from Marblehead didn’t make for the easiest trip. After a growth spurt in high school — Abu said he was 5 feet 9 inches as an eighth-grader, and is now a chiseled 6-8, 240 — and the success he had at Marblehead, Kimball Union, and with the AAU team, college coaches began to take notice. Mark Gottfried, in his fourth season with the Wolfpack, remembers what he saw. Abu might be all smiles off the court, but he’s all business on it. He’s averaging 6.4 points and 4.7 rebounds, and may have played his best game in his last game, when he had a double-double (13 points, 12 rebounds) as N.C. State upset the East Regional’s top seed, Villanova, 71-68. The 31 minutes Abu played were a season high, punctuated by a pair of one-handed slams that left the basket and backboard shaking for a full 30 seconds. Abu will have his hands full on Friday against Louisville’s Montrezl Harrell, a junior who has similar size (6-8, 240) but is nearly averaging a double-double (15.4 points, 9.2 rebounds). Abu helped hold Harrell to 7 points on 1-of-5 shooting in last month’s meeting. Admittedly, playing college basketball so far from home isn’t what Abu envisioned. He said he had Connecticut, Providence, and Rhode Island on his short list of schools nearby, and turned down a scholarship offer from UCLA, one of a number of schools he considered that weren’t close. A devout Muslim who prays multiple times a day and observes Ramadan, Abu said he visited a mosque in Raleigh while on his official visit. It was a sign, one of many, that N.C. State was where he is supposed to be. “It’s where I felt the most comfortable. I just wanted to have that overall college basketball feel, and playing in front of 19,000 people is probably the best way to get that feel, at least for me,” Abu said. “I always thought I would play close to home, so my family could watch me play. I guess I wanted to spread my wings a little bit, see another world.